A number of cutworm species are present in North Carolina and can potentially feed on tobacco. These include the variegated cutworm (Peridroma saucia), black cutworm (Agrotis ipsilon), and spotted cutworm (Amathes c-nigrum). Cutworms overwinter as larvae or pupae, depending on the species. In early spring, overwintering larvae of some species become active, feed, and complete their development. In other cases, moths emerge from overwintering pupae and lay eggs on host plants or other vegetation. Therefore, depending on the species, damaging cutworms found in spring may be overwintered larvae or new generation cutworms. Cutworms develop through five to eight larval instars (again depending upon the species). 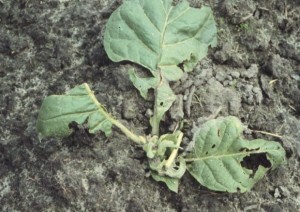 If damage begins at field edges or near weedy patches, it is likely that overwintering larvae are moving in. If damage is distributed throughout the field and does not begin at the edges, it is likely that adult moths are laying eggs in fields. A field-wide distribution due to adult egg laying is more common in years with warm springs. Cutworm feeding first presents as small, webless holes on young leaves. As the larvae grow, they begin their typical cutting behavior. Cutworm larvae can be distinguished from other caterpillars because they curl into a circle when disturbed. Fields are more likely to be infested if they were weedy the previous fall and winter or they are low-lying with heavier soils. Because most cutworm species are active only at night and populations are clumped, scouting should be done in the evening near damaged plants. 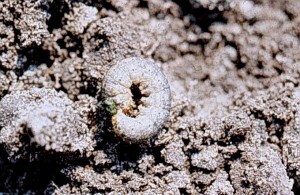 Cutworms are occasionally a problem in scattered fields, but most fields do not require treatment. Because of this fact and since rescue treatments are available, spending extra money on preventive chemical control is not recommended. You can, however, reduce the likelihood of cutworm problems by preparing the soil 4 to 6 weeks before transplanting. Whether you use preventive control or not, you should check fields often during the first 3 to 4 weeks after transplanting. Treat when 5 percent or more of small plants (within 3 weeks of transplanting) are killed or injured. Treatments are most effective if made late in the day, near when cutworms are active. Border treatments may also be effective, as cutworm larvae often move in from weedy field edges. 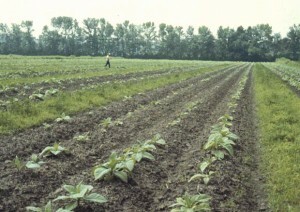 A number of materials effective against caterpillars are registered in tobacco. Many Bacillus thurigiensis materials are OMRI listed.